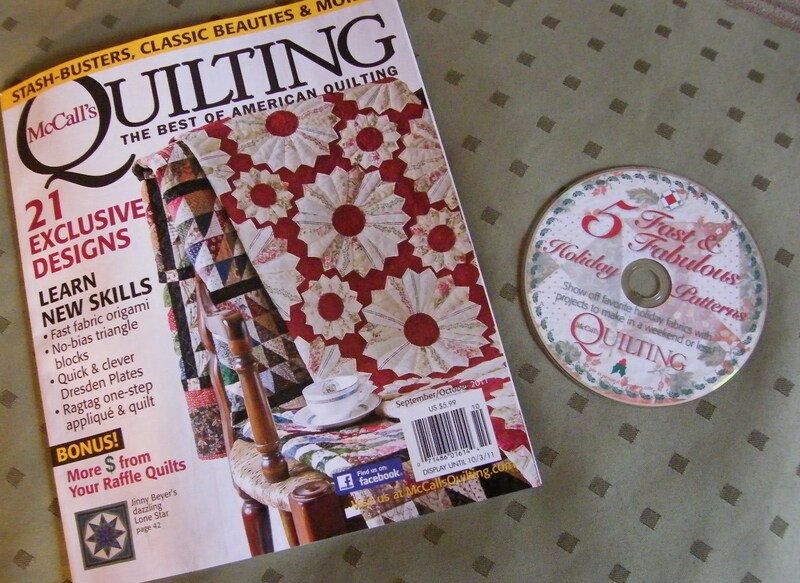 I knew I'd find the Sept/Oct McCalls Quilting Magazine here in Maine. There is a Barns and Noble near the Quilt Show in Augusta. A quick trip to the bookstore and before I was even out the door, I was ripping open the plastic bag and flipping through the magazines to find my article. Ahh, here it is. I was so proud. They did such a nice job of laying out the article. It's been months since I last wrote/read the article and it was like I was reading it again for the first time. Hy hubby read it for the first time, and he thought it was awesome. He wants my autograph!! It sounds like the issue is on Canadian newstands now too. I received nice notes from a few of my friends to say how nice the article is. Besides my article :), this issue has so many nice patterns in it and it will be such a nice keepsake for me. In the magazine was a CD with 5 holiday patterns. I can't wait to see what they are. The Maine Quilt show was awesome. I definitely have pictures of my top 100 favorites, but I need to review them closely and will do a top 5 for you within a day or two. I loved the recycled bridal challenge. And I really enjoyed the many chapter challenges. Where do people get all the ideas. It ccertainly is inspirational? The Maine Quilt Show goes on for two more days. If you are within driving distance, it would be worth the trip for you. I guarantee it! Many people have made these soothing heat bags with rice, but I made some today with buckwheat. For the covers, I enjoyed using up some scrap fabric. A fat quater will yeild you two bags. If you don't have any buckwheat, you can buy it from the Co-op farm supply on the north side, just past the Pizza delight. It is $1.10 per pound, and it takes about a pound per bag. I'm sure you could get it cheaper if you bought a bigger bag. I got a couple of good suggestions to use these bags from yesterdays commenters. Do you have any different uses for them? Start with a 9" x 18" piece of quilters cotton and about 3 cups of buckwheat. Iron down one of the short ends by about 1/2 inch. Fold the piece in half with right sides together and pin. Sew the long raw edge, and the short raw edge, leaving the short folded edge open. Fold in quarters like an accordian. Give a good press to really set in the creases. Through the open end, fill with 3/4 cup of buckwheat and shake into the bottom quarter of the bag. With the buckwheat safely in the bottom section, stitch along the first crease. You might want to use pins to hold the buckwheat out of the path of the stitching needle. Continue adding 3/4 cup of buckwheat and then stitching until all four sections are complete. Add a scrappy bow and add a note to microwave for 1 minute. Then apply to neck area for a warm soothing rest. I had a friend come over to work on a little sewing project with me. She recently downsized and had to get rid of her sewing stuff, but she managed to save a bucket of buckwheat, and she wanted to use it up. So we made buckwheat bags. They are similar to the Magic Bags that you might have seen in the drug stores. She has many friends in the seniors complex where she lives and she will give some of these away as small but useful gifts. Wouldn't you love to get one of these as a gift? I took pictures along the way, so I'll post a little tutorial tomorrow. Emily came for a visit today. She was right in the middle of a sewing project at the cottage last weekend, when my sewing machine had a breakdown. So Emily came to the house today to finish her project. While she was sewing her project, I was making her and her sister new warm and cozy sleep pants. These are custom sleep pants with quilters cotton flannel fabric for the front, and pink happy face quilters flannel for the back. Emily's pants have two blue side pockets that are the perfect size for her Ipod Touch. Emily says they are the most warm and comfy pants EVER!!! 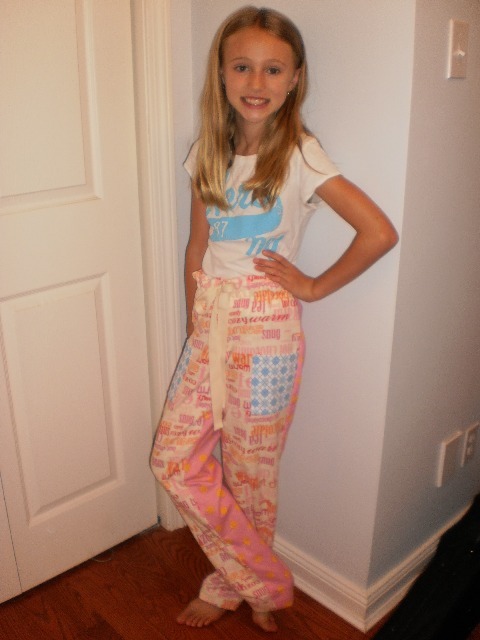 Jessica's sleep pants were custom made with 4 different fabrics on the legs, and two more fabrics for each of the pockets which were custom done to fit her Ipod Touch, and her Kobo eReader. She got her pants today, but they're a little tight, so we're going to make another pair to send home with Emily tomorrow. I can't believe how fast my July is flying by. There is only one week left to report on my Winter Wonderland progress. I did finish my third block late last evening. It has been hot all week, but I've enjoyed sitting on the porch in the afternoons. It's funny because as I was stitching this block which features some winter birds, I was watching our own neighbourhood robins bring wormy treats to their babies who have recently hatched in the cedar tree by our front door. We can hear the peeps when the mama bird brings the worms. After three blocks finished, I'm finally getting in the groove. It's taken all four weeks to get my fingers to the point where the calluses are performing well. They are really nice, just the right size to still let me know that the needle has come through, yet tough enough that my fingers don't hurt any more. I also bought proper needles that can take the perle cotton easier. The needle threader I was using broke, and I realized that the eye was just too small for the perle. I have my little stash of necessities (thread, scissors, needles etc) all in one place, and it will all stay together until I'm done my project. The next block that I'll be starting this evening will be the long skinny holly block. I bought myself the smaller spring hoop to do this block. I think I'll enjoy using it. I'm very excited. 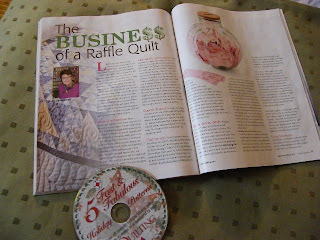 In this latest issue of McCalls Quilting which was just released, there is a Bonus article titled "More $ from your Raffle Quilts". 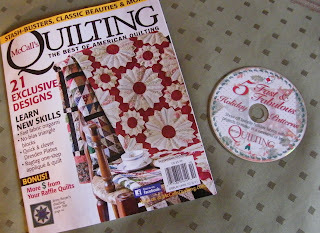 It was written by me, and I'm so pleased that McCall's Quilting published it. I haven't seen the paper issue yet, but you can bet I'll be scouring all the newpaper stores looking for it. I hope you all read it and let me know what you think. Hubby and I took the Jessie and Emmie to the new Harry Potter movie this afternoon. It was an amazing movie, and we all really enjoyed it. 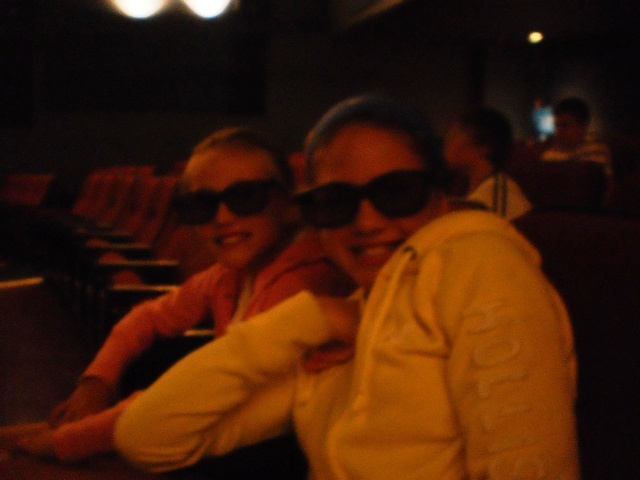 Don't the kids look cool in their 3D glasses. It was our first Harry Potter movie but the kids were well versed and have seen all the other movies many times. So now hubby and I will have to go back and watch the first 7 movies to catch all the things we didn't understand like horcruxes and a snitch. After the Harry Potter Movie, we did some indoor stuff because it was pouring rain outside. Emily decorated a chocolate cake for supper. 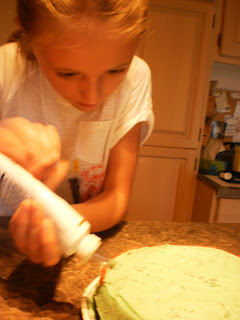 She got to use my new Wilton 56 piece cake decorating tips. And of course we did a good bit of sewing. Both Emily and Jessica had major repairs to make on their blankets, so they picked through patches and sewed them on. 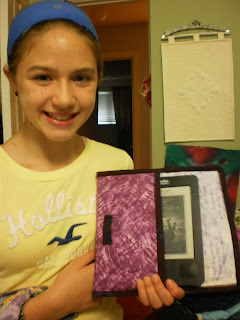 And we made a Kobo case for Jessica's new black Kobo. 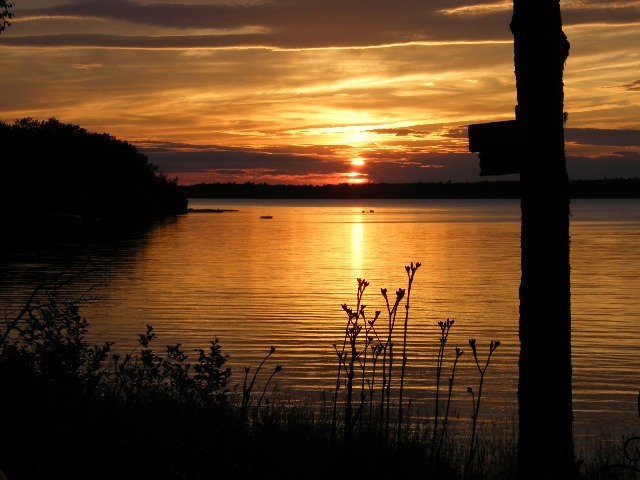 Tomorrow we're going to head to the cottage for some swimming, and relaxing for the weekend. I'm loving the blooms in my garden. 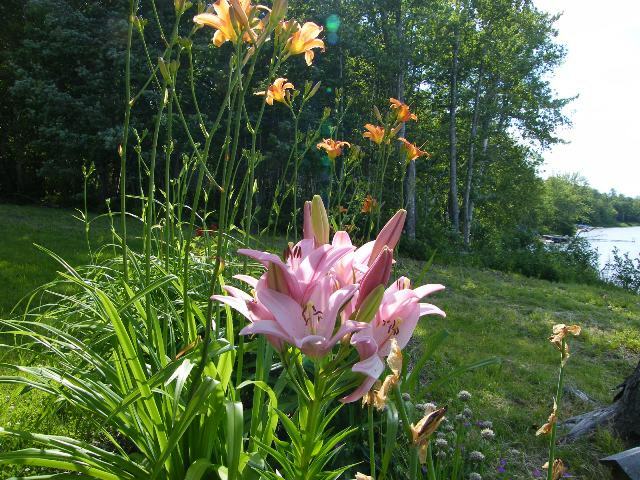 My sister gave me this beautiful full Stargaser Lily last year. I love the color. As I drive around our neighbourhood, I see everyone's gardens are in full bloom too. They are loving the hot weather. This picture tutorial is for a simple case to hold your new Kobo Touch eReader. This new reader is slightly smaller than the original Kobo. Since the screen is especially sensitive, I have an added inside pocket holds a firm material so it protects the screen. Of course, this is optional. **If you have the original Kobo eReader with the click button, go here for the fabric requirements to make a cover. Kobo Touch dimension - 6.5" x 4.5"
The directions for this cover will be slightly bigger by about 1/4"
Cover Fabric - 15.5" x 8.5"
Lining Fabric - 15.5" x 8.5"
Thin Batting - 15.5" x 8.5"
Layer the Top fabric, the batting, and the lining fabric and prepare to machine quilt. Machine quilt with a simple all over pattern. With, the lining side face up, add raw edge of the folded pocket fabric, and raw edge of the folded binding to the short side of the quilted sandwich. Stitch down using scant quarter inch seam. Trim away excess binding and pocket fabric so it's all even with the quilted sandwich. Iron the binding over and top stitch the short binding piece from the cover side. The hidden pocket should still be to the lining side. Fold up the bound edge 4-3/4" and pin sides down. Stitch sides down with 1/8" inch seam to hold the fold firmly. Prepare to Bind. Use your favourite binding method to add binding to the 3 raw edge sides. Top Stitch your binding on the 3 sides. Cut plastic canvas just slightly smaller than the pocket of the cover. Turn the cover inside out, and slip the plastic canvas into the hidden pocket. Turn the cover right side out, and Voila, you're done. Last week I showed you the progress on my first stitched block. It was the second largest block so it took quite a while. I did get it done last week, and here it is. 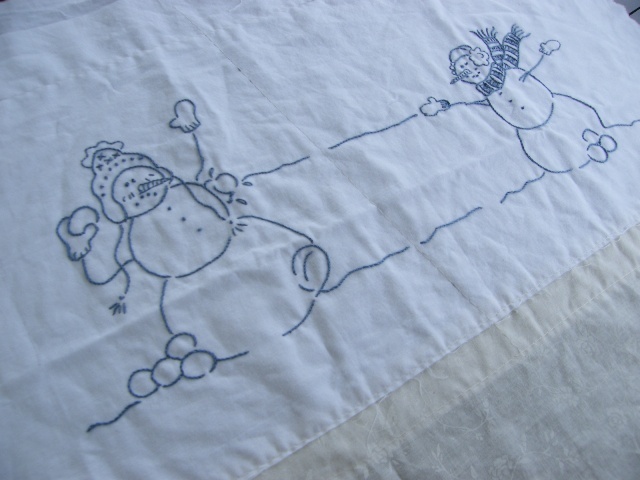 While I started out using just the stem stitch, I find that on the printing of the sign and the finer details on the snowman faces, I use the back stitch. The pattern calls for either or, but I'm using a combination of both where I see fit. I was looking for a quick finish, so my next block was a small block. And it's done. With no trees, and no snowflakes, it was a quick finish. So now I'm working on my third block...a larger block. My fingers are sore, and I've developed a couple of calluses on the tips of my fingers, but I'm sure I'll get this done this week. Only two more weeks in my Christmas in July challenge, and I know now that this won't all get stitched in July. But I do have a really good sense of how long it will take me. While letting my fingers rest, I did start on the pieced blocks and I have the first of 6 sets of blocks done. This first set had 5 blocks. I had no idea that these blocks would take so long to make. I'm so used to cutting out many blocks at a time, then sewing those blocks all at once... This is very different. The blocks are either a 12", or a 9" or a 6". No two blocks are the same size or color combination. I know it took twice as long to choose the colors and cut out the pieces than it did to sew them. I sewed one block at a time... I'll plan my time better for the rest of the sets of blocks. I am discovering that I get lots of stitching done while sitting out at the cottage. And if there's something good on TV for an hour in the evening, I get stitching done then too. Now that I'm in week three, I find that I'm developing little techniques to help me stitch cleaner, without the long knotted tails in the back. I'm not sure if it's the right way, but it's working for me. I've been looking through patterns with the intent of making a raffle quilt for the St. Anthony's Quilters to quilt this fall and winter. 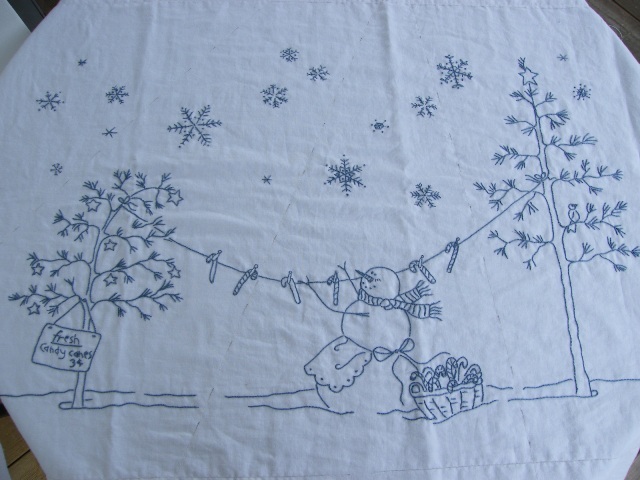 I'm so pleased that Gail F. has said it was OK if I used her Starry Path design which she called Sylvia's Stars. I loved it when she first posted it on her blog. Then I loved it even more when I saw it at the Sussex Quilt Guild Show last year. Then I loved even more when I saw that it won a ribbon at the Quilt Show. If you click here on Gail's post where she has this quilt on the rack and it's half quilted, you'll see the fabulous design she came up with to fill the white squares. Last year was the first year of hand-quilting for the St. Anthony's quilters. With a year under their belt, I think they're ready to do more than stitch in the ditch. 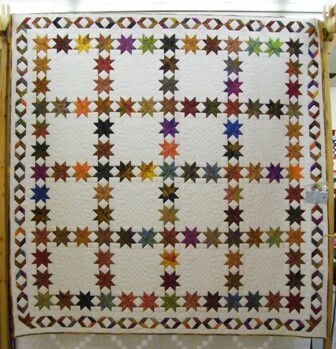 Don't you think this will be a striking raffle quilt? How could you not buy a ticket! This coming week, I'll be sewing up a few sample stars to see which six inch star pattern I will use. Then I'll be figuring out a sewing workplan so I can have this top ready for the group to start hand quilting this fall. The lazy days of summer are here. The warm weather is welcome after the rainy cool spring we had. We're enjoying more weekdays at the cottage rather than waiting for the weekends. The sunsets are so picturesque. I love that the flowers there are all coming up nicely and effortlessly. 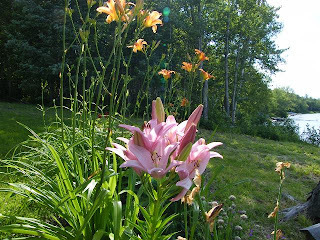 My Tiger Lillys are about to open up and will show off against the backdrop of the lake. I'm quite pleased with my progress on my first Winter Wonderland block. It's Sunday, and if I can find a good movie on TV, I'll surely have it done before turning in for the night. All I have left to do is the little Fresh Candy canes sign, a snowlady arm, and a part of the clothesline with 4 candy canes. Yippee. I think I'll do a couple of smaller blocks next to see if I can get them done by next Sunday. I think I'll do a couple of the pieced blocks this week too. The beautiful warm weather is here. I'm not really working on any big sewing projects. 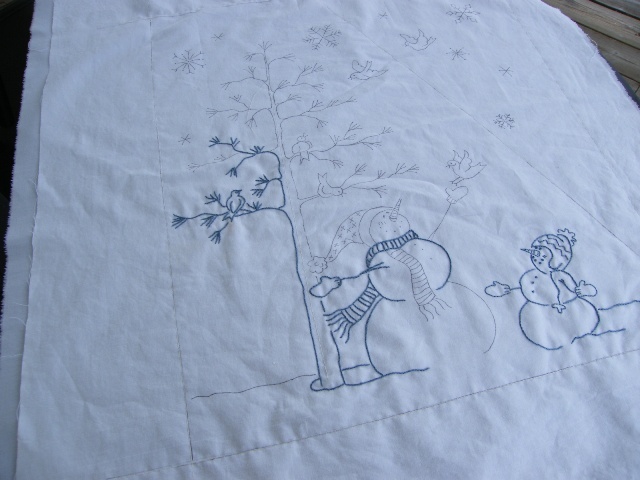 Although, I am working on hand stitching my Winter Wonderland project. It's great for sitting in the shade on these wonderful warm days. I did take a little time to finish this little project which was my warm up project before starting the big Winter Wonderland project last week. Since it's Christmas in July, I thought I'd finish it off with some summery flowery colors for the borders and binding. I machine stitched the binding with my favorite bi-level Pfaff foot, which made for a really quick finish. I'll hang it on a wall first chance I get. Why wait for Christmas, right? BTW - this is a design from Gail Pan Designs. It can be downloaded here.